The Chinese icebreaker Xue Long‘s rescue of the passengers aboard the stranded Russian research vessel MV Akademik Shokalskiy has made headlines around the world. Since December 24, the Russian ship has been stuck in pack ice near Antarctica’s Cape de la Motte, approximately 1,700 miles south of Tasmania. MV Akademik Shokalskiy was about midway through the month-long Australasian Antarctic Expedition, run by the University of New South Wales, to retrace the 1911-13 journey of the Australian explorer of Antarctica, Douglas Mawson while also conducting climate science research. Australia’s icebreaker, Aurora Australis, first set out to rescue the 52 passengers on board. France’s L’Astrolabe icebreaker, also sailing near Antarctica, tried to help. But when neither ship could perform the rescue due to challenging weather conditions and thick sea ice, China’s icebreaker, Xue Long, stepped in. Xue Long had been nearby in the Southern Ocean, two months into a five-month expedition partly to begin construction on China’s fourth Antarctic research station. But Xue Long also could not safely break through the ice to reach Aurora Australia. In the end, the decision was made to rescue the passengers using the Xueying 12 helicopter on board the Xue Long. After five flights carrying 12 people at a time, all of the passengers were brought first to Xue Long and then by barge to Aurora Australis. The Russian vessels’ 22 crew members are remaining on board the well-provisioned ship in the hopes of eventually steering it out of the ice. It’s interesting to compare how various media outlets are reporting this story. The Guardian, which actually had its science reporter Alok Jha and video producer Lawrence Topham on board the MV Akademik Shokalskiy, says, “A helicopter sent from the Chinese icebreaker Xue Long landed next to the trapped Akademik Shokalskiy on Thursday afternoon and the first group of passengers were evacuated shortly after 8pm local time.” (Video from The Guardian here). 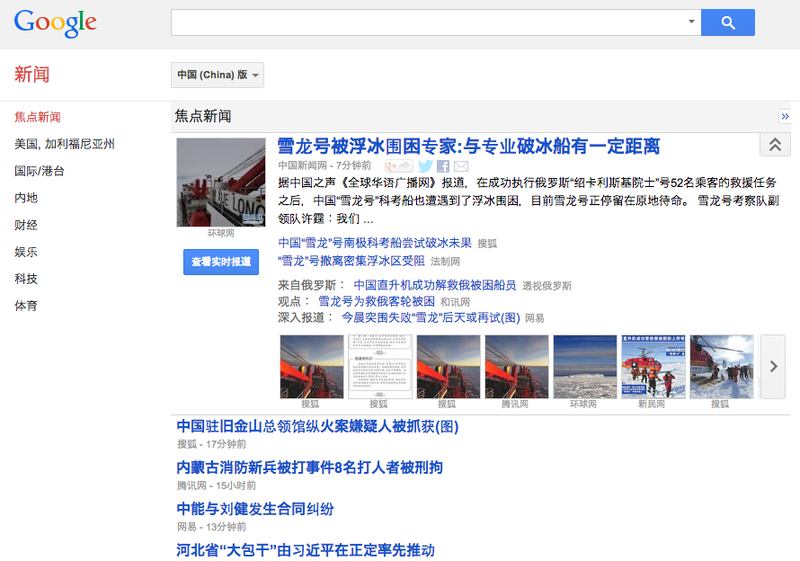 Coverage of the rescue, and China’s activities in the Antarctic, was more neutral than just a few months prior, when Xue Long set out on its current voyage. 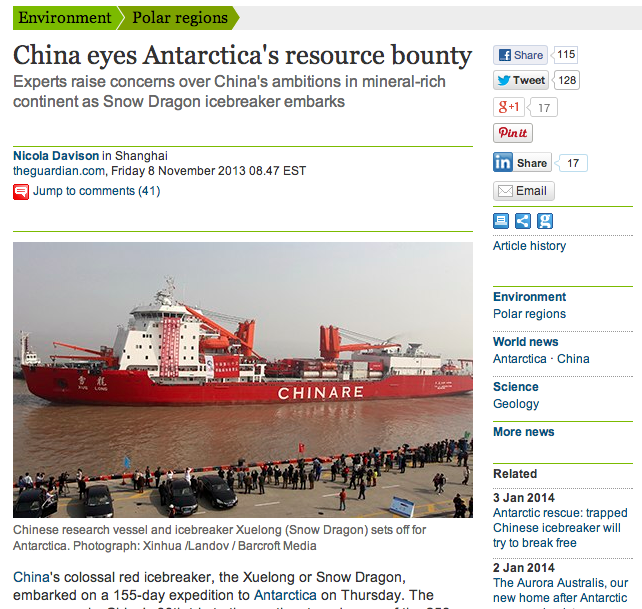 A November story in The Guardian was then headlined with: “China eyes Antarctica’s resource bounty: Experts raise concerns over China’s ambitions in mineral-rich continent as Snow Dragon icebreaker embarks.” More recently, Business Week offered somewhat snarkily, “Luckily for people stranded since Christmas Eve in Antarctica, China is trying to become a global power in science.” But on the flip side, rather unluckily for the Chinese (and Australians, French, and now Americans), they’ve all been distracted from their scientific goals at hand. The Australian academics’ commemoration of an Antarctic voyage that took place one century ago has drained the region’s human resources by necessitating the diversion of Chinese, French, and Australian expeditions from their main tasks. The Australian government will foot the $400,000 rescue bill, but no amount of money can make up for the lost time on the Chinese, French, and Australian expeditions in the short operating season in Antarctica. Now, the U.S. Polar Star is going to help assist the vessels stuck in the ice, further putting a strain on the human and technical capabilities in Antarctica. Experts – like the French polar chief, who has already done so – thus might want to raise concerns over the ambitions of Western researchers seeking to retrace the paths of explorers from 100 years ago (while, it should be noted, also carrying out some scientific research) rather than focusing on the supposed resource grabs by Asian states. Further highlighting the importance of Xue Long’s mission in the eyes of Chinese officials, Xinhua reports that President Xi Jinping personally requested an “all-out” effort to ensure the safety of the staff on board, asking them to remain calm. He also greeted the crew in a special message. The simple fact that China had the infrastructure – not just an icebreaker, but also a helicopter – to rescue the people on board the Russian ship demonstrates that Asian involvement at the poles can benefit all users of the region. 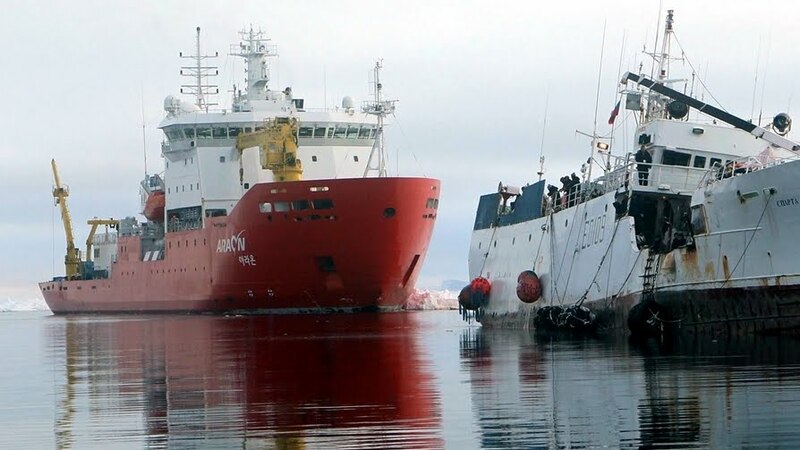 Even if one were to cynically argue that countries like China and also South Korea are just exploiting the poles for national gain, at the very least, with more icebreakers and crew members trained in search and rescue present in the Antarctic and Arctic, the regions become safer places for all involved. Let’s not forget that in December 2011, the Korean icebreaker Araon rescued the 32 crewmembers on board the Russian fishing trawler Sparta after it struck ice in the Ross Sea off Antarctica. 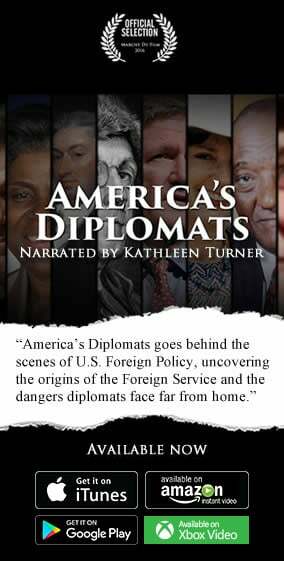 Two years later, a similar story has played out again, this time with China instead of Korea coming to the rescue. It won’t be surprising if these two Asian countries become more involved in polar search and rescue – and in fact, perhaps their participation in multilateral training and exercises in the region should be encouraged. Araon rescuing Sparta in December 2011 off Antarctica.